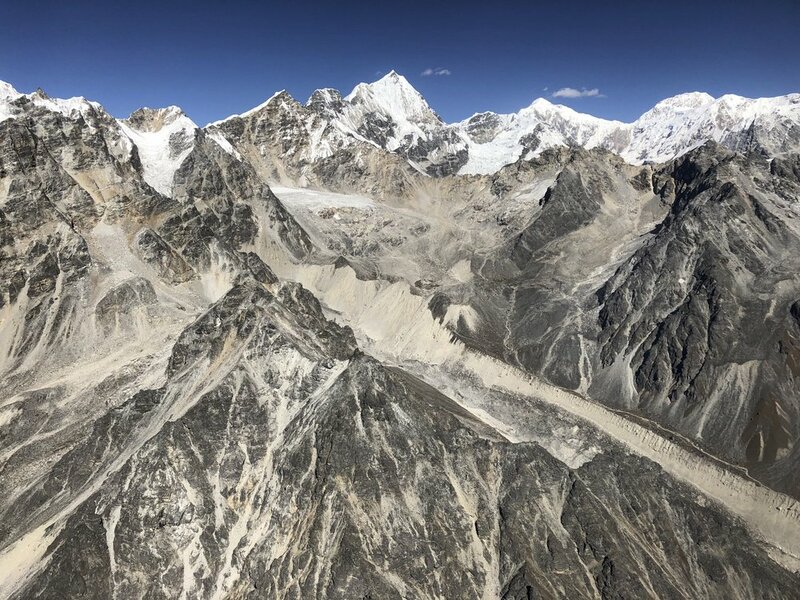 In October of 2018, we traveled to Nepal to complete the Tilman Pass and Ganjala Pass trek. We approached the Tilman Pass from the south side via the Panch Pokari Ridge. We then descended to the Langtang Valley, explored the Langtang Glacier and exited the Valley via the Ganjala Pass. We also managed to take a helicopter tour of the Langtang Valley north of Kyanjing Gomba. All in all, it was a wild and challenging trek through wild and remote area of the Langtang Himal. Thanks again to mountainsunvalley.com for all the help with putting this together. For Annotated Photos from the Ganjala Pass see here. We were lucky again and managed to get in a helicopter in Kynjang Gomba. So it happened that a group of trekkers were taking a helicopter back to Kathmandu while we were there. 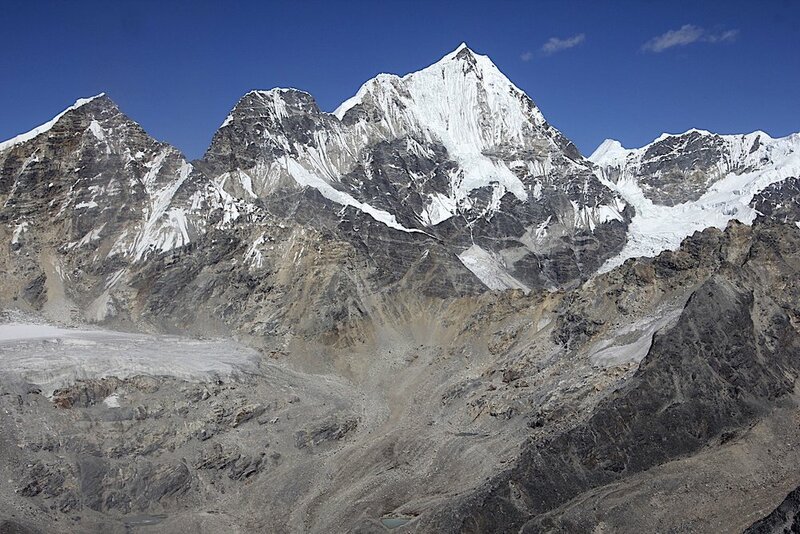 We hired the helicopter for a tour of the upper Langtang Valley. 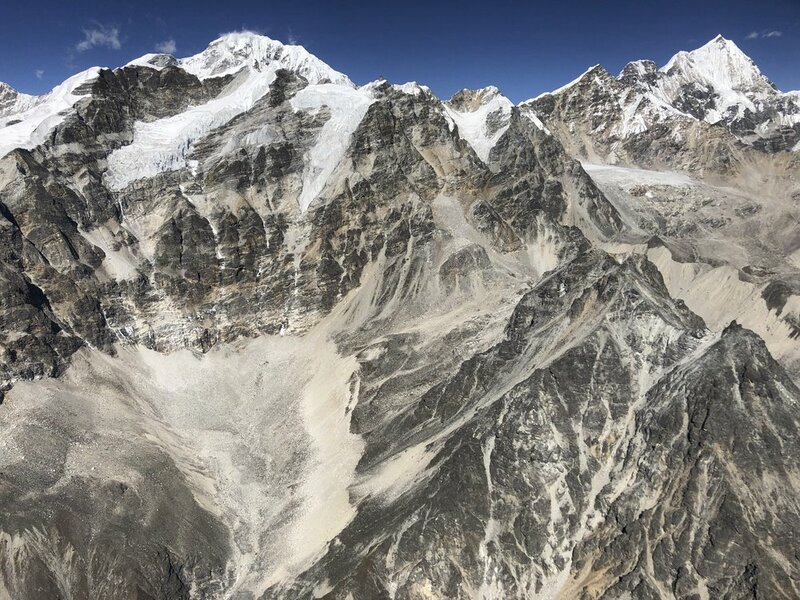 Pemthang Karpo Ri’s North-west ridge from 19,000ft! Panoramic view of the Langtang Valley. The Langtang Glacier is in the middle. Shishapangma in Tibet is on the horizon. Penthang Karpo Ri is on the right. 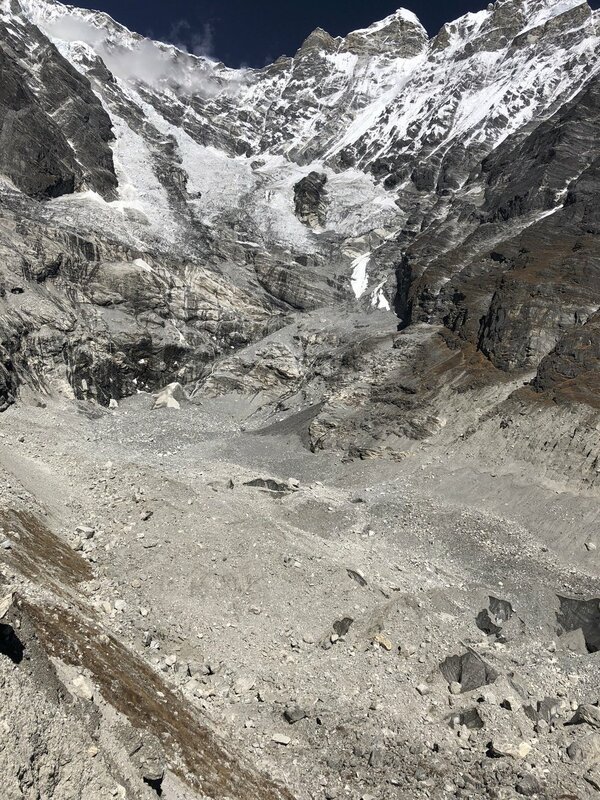 On the left is Shalbachum Glacier, and on the right is the Langtang Glacier with Mt. Shishapangma looming above in the centre. Langtang Himal from the helicopter. 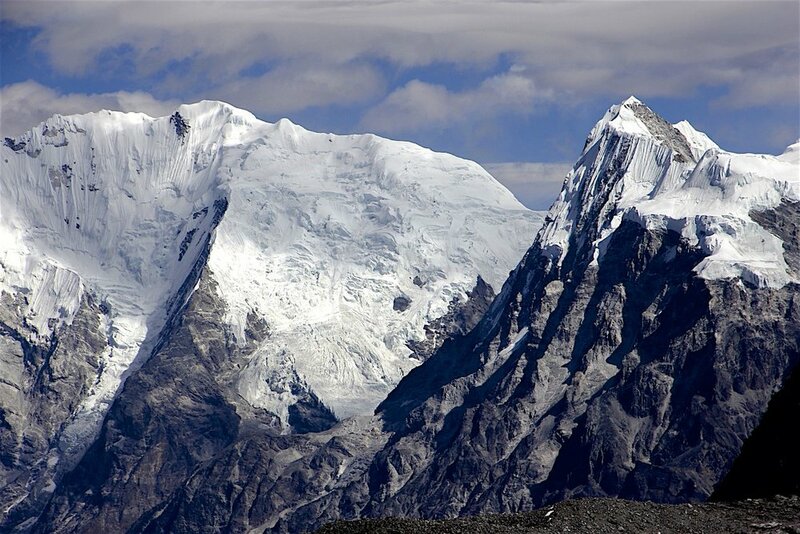 Kyunggari 6,599m on the left and Shaishapangma 8,013 on the right. The Shalbachum Glacier is in the middle. The Langtang Himal from the helicopter. 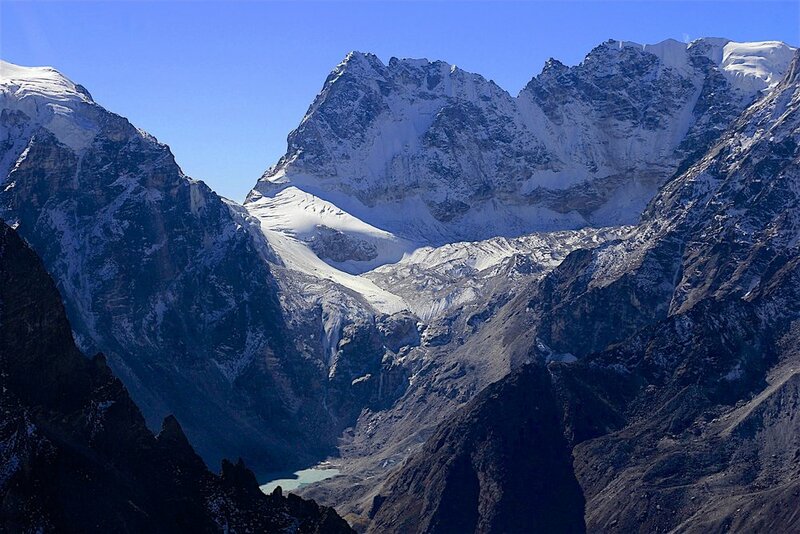 The high mountain on the left/centre is Shalbachum 6,707m and the pointy peak on the right is Kyunggari 6,599m. The point peak is Kyunggari 6,599 and the one on the horizon is Lantang Ri. Pempthang Karpo Ri on the left. Langtang Ri and the end of the Langtang Glacier. 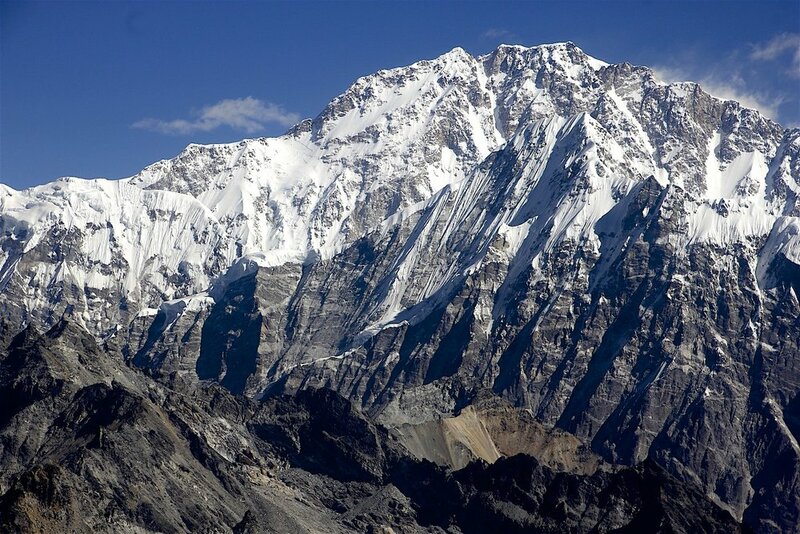 The langtang Glacier is 35 km Long. 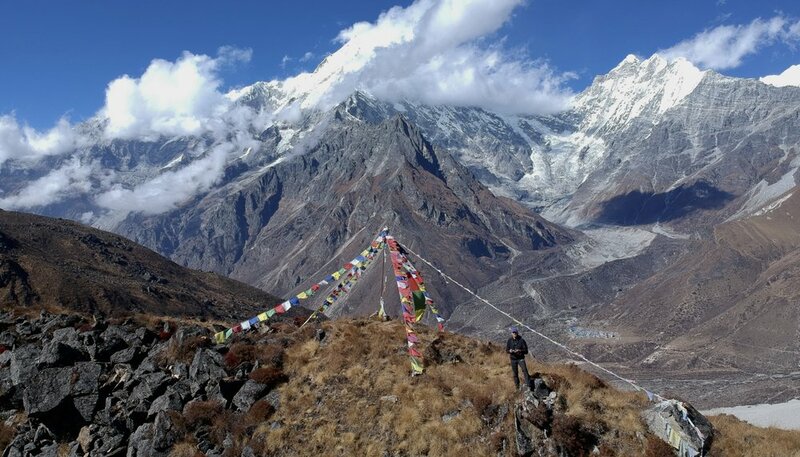 It is actually a multi day hike to get to the base of the Langtang Ri. Although the glacier is in Nepal, all the surrounding mountains are in Tibet. 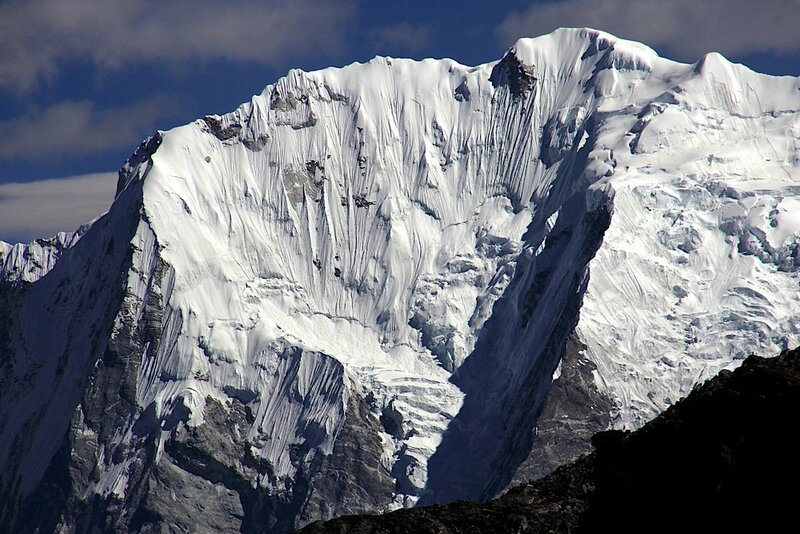 Shishapangma south face 8,013m located entirely in Tibet. 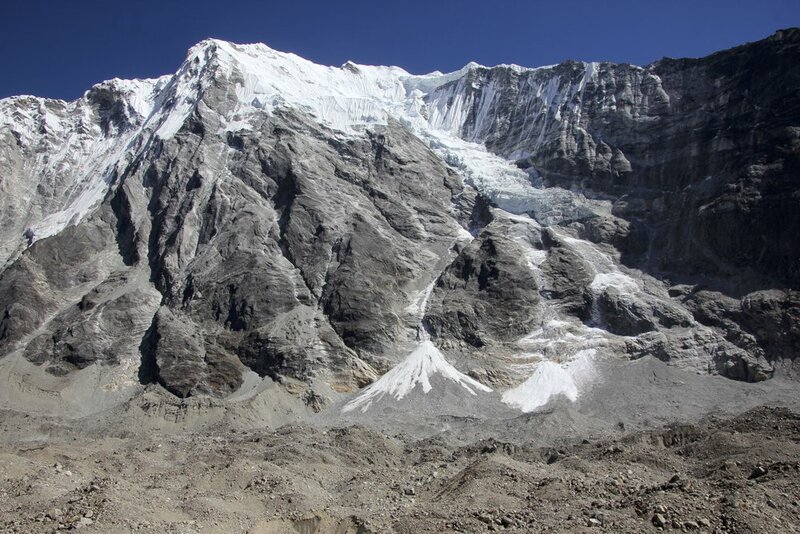 Langshisa Glacier and Ganchempo Peak. Lanshisa Glacier in the middle and the Tilman Pass in the right upper corner of the photo. A close up of the Tilman Pass and the high camp by the green lake. This was our route. Down the glacier to the green lake. Langtang Himal along the Langshisa Glacier. Mount Dorje Lakpa is on the left. 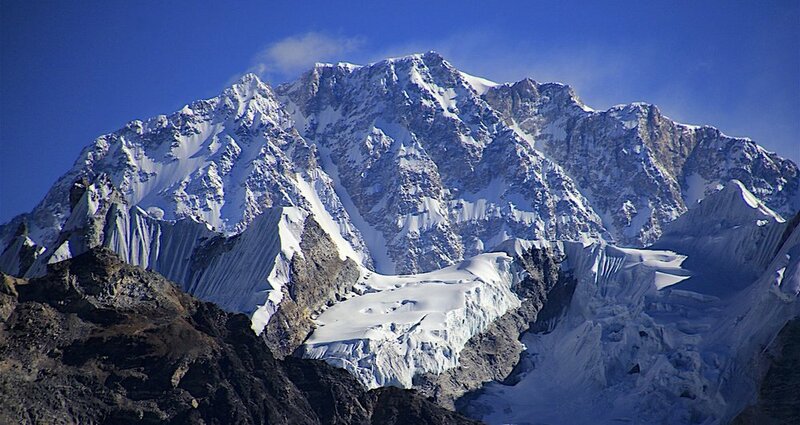 Yala Peak on the right (high point of the rocky ridge) and the Langtang Lirung group on the left. 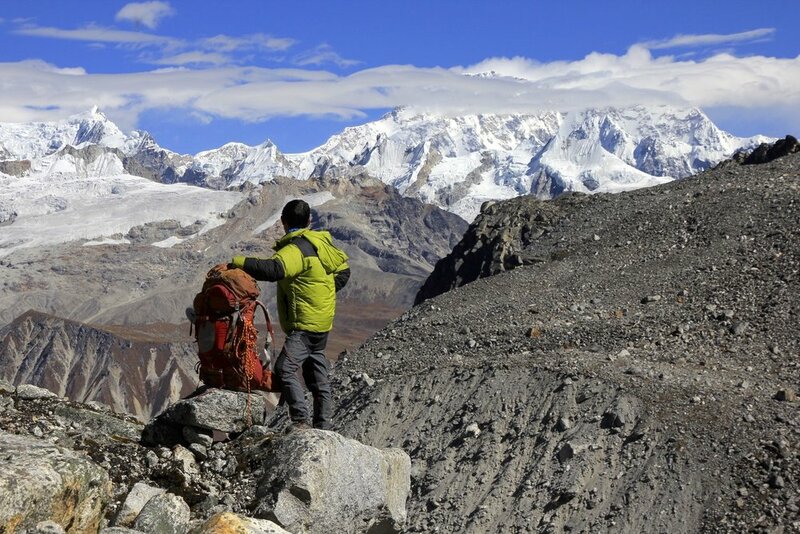 Exploring the Langtang Glacier. It is deceptively long and apparently it takes 3 days to get to the end of it from Langshisa Kharka. 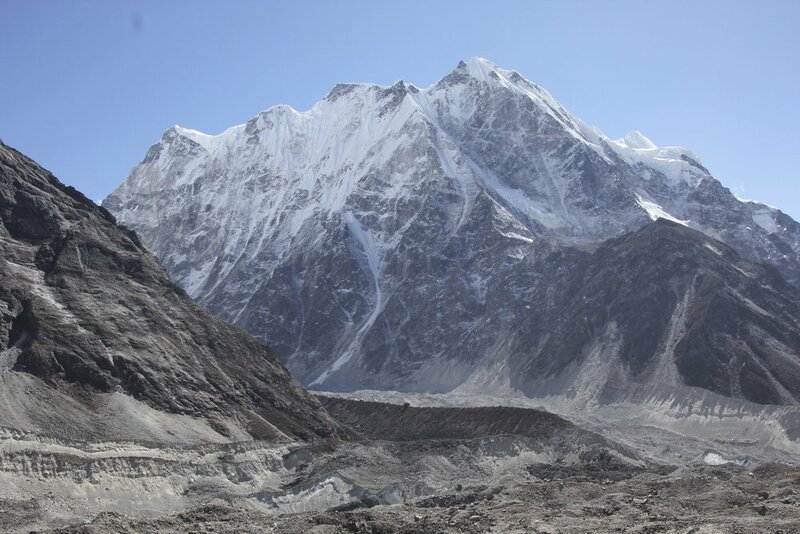 The Langtang Glacier. I am standing across from Langshisa Ri. Langshisa Ri north face and the Langtang Glacier. The wall along the Langtang Glacier. 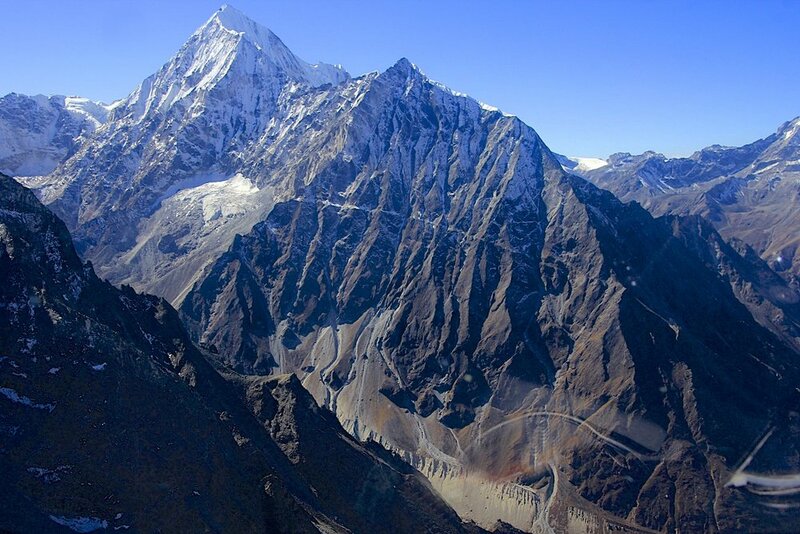 The mountains on the border between Nepal and China along the Langtang Glacier. Langtang Lirung Glacier - Looking at the Langtang Valley 5 km away and 800m below. Langtang Valley, Mt. Langtang Lirung (left) and Mt. Shishapagma (in the distance with a line of clouds above it) from the climb to Ganjala Pass. Langtang Lirung from the basecamp for Ganjala Pass at 4,300m. Morimoto 6,150m and Dragmarpori 6,578m. Looking back at the Langtang Himal from near the Ganjala Pass. Shishapangma dominates the view. We hiked from 4,300 to 5,130m in 4 hours. Rocky approach to the Gajala Pass. It was dry but wobbly and steep. The steep final approach to the Ganjala Pass. Ganjala Pass, the approach is via the snow covered shelf on the upper right. Chains have been installed for safety and a ladder for the porters. The narrow crest of the Ganjala Pass. The altitude of Ganjala Pass. This was our 20th major trip! A true milestone for David and me. I am lucky to have a good friend in David to share the interest and passion for travel to wild places. Looking down at the approach route to the Ganjala Pass from the now distant Langtang Valley. Ganjala Pass at 5,130m. It is a surprisingly beautiful pass and yet not very popular! 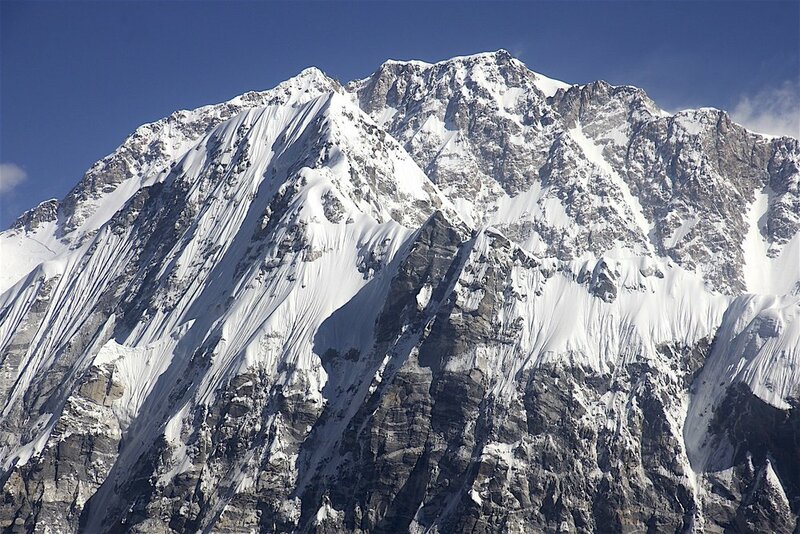 It is so close to Kathmandu and near such popular trekking route. It did remind me of Renjo La a little. Ganjala Pass and back side of Naya Kanga. Looking south from Ganjala Pass. The south high camp is located by the two small lakes below at an altitude of approx 5,000m. Looking south from Ganjala Pass. The view from the pass. The Yala Peak is the rocky ridge on the right. It was sad to see how the glacier retreated in the last decade. We went there in 2009 (see the post) and most of our hiking was on ice. Morimoto 6,150m from the Pass. Pemthang Karpo Ri and Langshisa Ri. Coming down the steep south side of the pass. Looking back at the rocky descent from the Ganjala Pass. You can spot our porters on the left! Distant view of the Ganjala Pass area from the south. The Jugal Himal in Tibet right before the sunrise seen from our descent round from the Ganjala Pass. The end. Packed and ready for our 75 km 10 hour drive back to Kathmandu and home. What a FANTASTIC trip it was!